For well over fifty years mechanical music devices aka jukeboxes like this were a critical part of our popular music industry ecosystem. They disseminated pop tunes from both national corporate and local independent record companies. Detroiters danced, sang, and gathered around them. They were installed in various communal spaces: bars, bakeries, and barber shops included. Many times they were built, installed, stocked, and repaired by union workers. The soundscapes they created with their owners, audiences, and coins created an ever-evolving sense of place and community. By the 21st century, most had been either replaced by digital streaming services or forgotten. 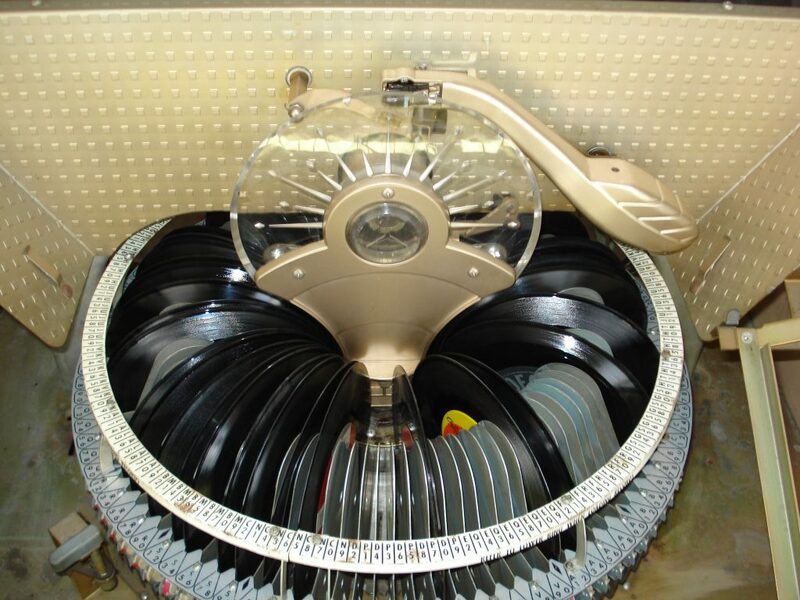 This Wurlitzer High-Fidelity & Stereophonic 2500 played at Jordan’s Barber & Beauty at Ferry Park & Linwood, not far from Motown, from the 1960s until it was donated to the Graystone International Jazz Museum & Hall of Fame, records still inside. Detroit Sound Conservancy accessioned this marvelous sonic gift into its collections in 2015. A mix by Slow Jams Detroit was commissioned in 2016 utilizing the 45s remaining in the machine and presented as a gift to donors. Finally in 2018, the jukebox was restored by V-M-Electronics and is now ready for new installations, records, and audiences. The jukebox will be on display at the Detroit Historical Museum beginning January 19th-April 7th. Learn more here. Restoration has now been completed and we are exhibiting the jukebox at 8 Degrees Plato (3409 Cass, Detroit, MI 48201) in Detroit from October through January of 2019. Learn more about 8 Degrees Plato here.